After a summer of adventures with many of her Girl Scout friends, Juliette has decided to take a rest and visit us here at the GSNC Service Center. And, just in time for her birthday! Juliette is inviting all of her sister Girl Scouts to come celebrate her birthday with her during the month of October. Visit the GSNC Service Center and take a picture with our life-size Juliette. Post that picture to either Facebook, Twitter or Instagram and tag Girl Scouts of Nassau County in the post and use the hashtag #HappyBdayJulietteLow. Once you have posted the picture, head into the GSNC Shop and show the cashier your post and she will give you a special “party favor” from Juliette. Wondering How to Tag GSNC in your Social Media Posts? Twitter: include @GSNC in your Tweet. 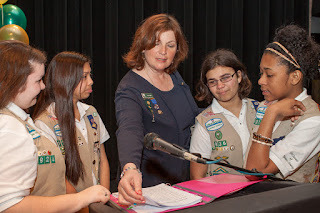 Facebook: include @Girl Scouts of Nassau County (when you start typing out the name, a drop down should appear… select Girl Scouts of Nassau County in the drop down.) you will know it worked by the name being highlighted in blue. *Please note this is only available during Council Business Hours and all the above requirements must be met in order to receive the special gift. Top 5 reasons to volunteer for Girl Scouts by Katie S.
There are countless reasons to become a Girl Scout Volunteer. I was challenged to list my top 5 reasons– so here they are for your reading pleasure! Did you know that Girl Scout Volunteers manage budgets, records, and bank accounts, book meeting spaces and field trips, communicate on various social media platforms, and coordinate the schedules of 12 or more girls? That’s why so many of our Volunteers smartly include their volunteer position on their resumes! Girl Scouts and camping have always gone hand-in-hand. Did you know that in addition to taking girls camping, Girl Scout Volunteers also help girls plant gardens, clean up parks and beaches, and advocate for the environment in their communities? Volunteers help girls earn outdoor badges on topics like trees, hiking, horseback riding, paddling, and even bugs! Nothing on earth tastes better than a Girl Scout Cookie. Girl Scout Volunteers help girls become Cookie CEOs! 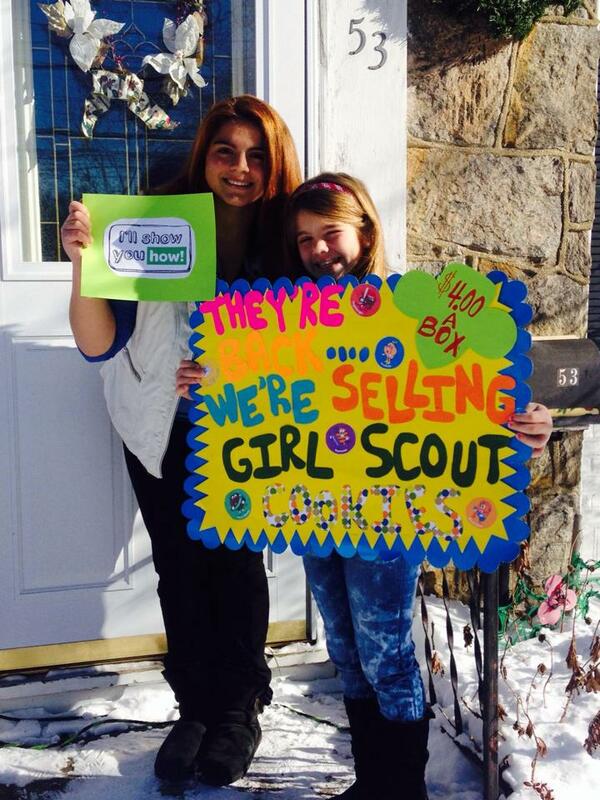 The Girl Scout Cookie Program is the largest girl-led business in the world. Through our Cookie Program, Volunteers help Girls learn skills they will use throughout life: goal setting, decision making, money management, business ethics, and people skills. Helping girls become business women AND eating tasty cookies? It’s a win-win! It’s well known that girls who participate in Girl Scouting make lots of friends, but did you know that our Volunteers make friends too? Volunteers work together as Co-Leaders, committee members, Service Team members, and at programs and events. We even have events especially for Volunteers like Oktoberfest and Expand Your Horizons Leader Conference, where you get to meet leaders from all over Nassau County! This is what being a Girl Scout Volunteer is all about. Volunteers truly build girls of Courage, Confidence, and Character who make the world a better place. At every Troop meeting, at every cookie booth sale, on every field trip and campout, YOU will change girls’ lives, and they will change yours. So what are you waiting for? Sign up to become a Girl Scout Volunteer TODAY! Are you familiar with “Operation Cookie,” our Council Gift of Caring program that encourages you to collect donations from your customers so that boxes of Girl Scout Cookies can be sent to our country’s military at home and abroad? Did you know that we have Gift of Caring programs for Mags&Munchies, too? Operation Stop Hunger donations go towards the purchase of nut items for a local food pantry and Project Thank you provides magazine subscriptions to soldiers and veterans. Every $5 donation to either program counts towards Troop proceeds and a girl’s Nut/Snack totals, and just two $5 donations earn the “Share” patch! When a customer says they don’t want to purchase nut/snack items or a magazine for themselves, ask if they want to make a donation to one of these worthwhile programs. 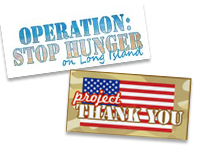 Donate to Operation: Stop Hunger on Long Island or Project Thank You! What Can a Girl Do? Be Spotacular & Reach New Heights with GSNC’s 2015 Mags&Munchies… and Memories Fall Products Program Mags&Munchies…and Memories makes it so simple to add to your Troop’s treasury early in the Scouting year, and it’s an easy way to earn fun patches, too! Design your own patch: You’ll receive a coupon to design your own giraffe patch if your customers make online purchases of at least $150 in mags and/ or munchies! How cool is that? “Made in Brooklyn” tour reward: For 50 Subscriptions/Keepsakes or 150 Nut/ Snack items (online and paper orders, combined), join with other entrepreneurial girls for an amazing weekend afternoon trip to Brooklyn, including a Mast Brothers chocolate- making tour! Tempting treats: Caramel Caps with Sea Salt and Honey Mustard Pretzel Mix are two of this year’s new choices added to last year’s surprising “fan favorite”… Almond Cran-Orange Crunch … and all of the other popular Ashdon Farms snacks and treats. Girl Scout Tote Tin: A tin with ribbon handles that looks just like a Girl Scout tote! And, it’s filled something new... tasty mint treasures. Enhancements to the Photo Keepsake order process: Improved and simplified way to order calendars, cards, memory books and other photo keepsakes. How does the MagsΜnchies Program work? Get your Mags&Munchies information packet and order card from your Troop Mags&Munchies Manager. Make your store your own by posting an entertaining picture, setting your goals, and entering email addresses for your friends and family. Create some marketing magic on your site by writing about the awesome stuff you’re doing in Girl Scouts. Beginning September 21, 2015 take your order card and magazine order forms with you when visiting neighbors and family, then tell them about how much fun you’re having in Girl Scouts and how they can help you and your Troop through the Mags&Munchies Program. Fill out and bring the business cards from your packet with you too, so you can leave one for any neighbors who aren’t home or are busy when you’re there. Complete 8 addresses in the “reach out” address booklet, and you’ll earn $2 for your Troop. Continue selling through mid-October, and turn in all of your paperwork and money to your Troop Mags&Munchies Manager by the date they tell you. Deliver Nut/Snack products in late November/early December to your customers anxiously awaiting their gifts and treats. How does the Mags&Munchies Program work?